Bishop's Castle is a small town in Shropshire, named after the castle it was built around. The castle was built by Robert Losinga, Bishop of Hereford in 1087. It was rebuilt and modified several times, but had fallen into disrepair, and was ruinous by the 18th century. All that is left of the castle now is a small piece of wall. Despite no longer having the castle it's named after, Bishop's Castle is still worth a visit. 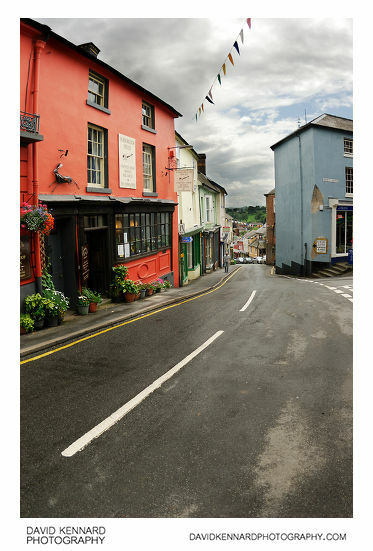 Below is a photo of the High Street, which is quite steep. Quite a few of the buildings in Bishop's Castle are painted bright colours. Below is the top end of the site of the old market hall. At the top, with the bench in front of it, is a large stone with the arms of the Earl of Powis engraved on it. 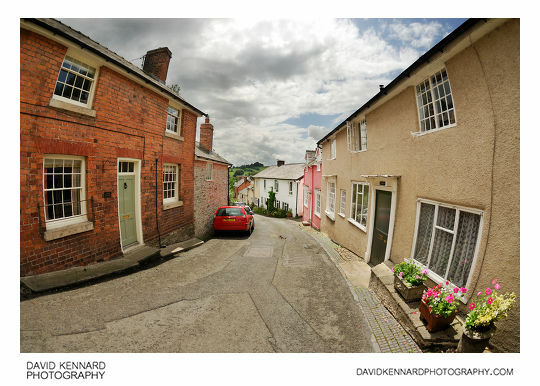 You can see more of the brightly coloured houses here as well. As usual, I used my fisheye lens to try and get in the buildings, and didn't have time to mess around with changing lenses. For post processing, I had to blend bracketed exposures for the majority of shots, and even then, quite a few shots have blown out highlights in the clouds. 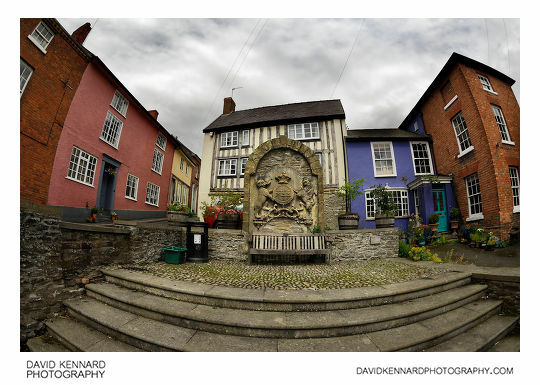 For more information on Bishop's Castle, the town has a website at bishopscastle.co.uk. And of course, Wikipedia has quite a bit of info - Bishop's Castle on Wikipedia. After visiting Bishop's Castle, we went on to Clun, which has a bit more castle than Bishop's Castle (but still far from a full castle).